The Ferdinand (left) and Filene’s. 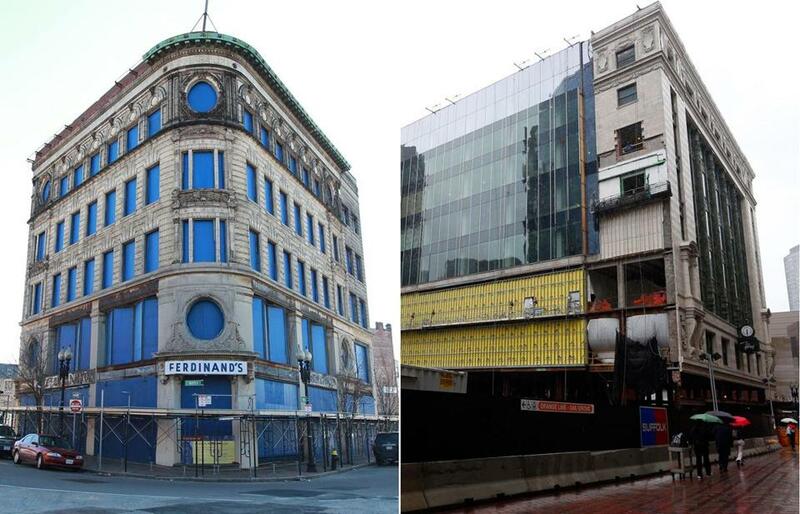 Five years ago, the Filene’s block in downtown Boston and the old Ferdinand furniture store in Roxbury’s Dudley Square were both holes in the ground. They’re now both rounding into shape. The building that once housed the Filene’s department store opened to its first office tenants earlier this year. 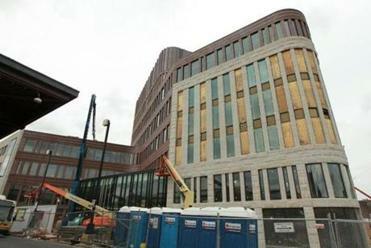 The Ferdinand, recently renamed after the late Boston City Councilor Bruce Bolling, has gone from a bombed-out-looking facade covered in blue plywood to a gleaming new municipal office building. Filene’s and the Ferdinand are the two best buildings Boston developers produced in 2014, and they’re special for similar reasons. They are good-looking developments on their own, but they really matter because of what each means for the neighborhood around it. On the Filene’s block, the 625-foot-tall Millennium Tower tends to hog most of the attention. And the condo tower deserves every look it gets. It will introduce substantial residential activity into Boston’s former commercial heart, and it’s helping to redefine the city’s fractious relationship with tall buildings. With a force like that, it’s easy to overlook the eight-story building next door, which was built for the Filene’s department store a century ago. But the Burnham building is just as important to Downtown Crossing’s rapid evolution. The Burnham building is the embodiment of the new Downtown Crossing, enabling the downtown to shed its image as a dark, past-its-prime shopping district, and become a dynamic urban neighborhood. Recent interest in the building has come from a stream of tech companies — from established firms to the Cambridge Innovation Center, a hub for startups. And it’s now the headquarters for an ad agency, Arnold Worldwide. Take a look at two key buildings for Boston’s development. Arnold’s move this year made the Burnham building the anchor of an increasingly young, creative neighborhood. In 2015, the grocer Roche Brothers will move into the space, catering to the old shopping district’s growing residential population and cementing Downtown Crossing’s break with its past. A few miles down Washington Street, Boston Public Schools staffers are preparing to move into the Bruce Bolling Municipal Building, a new schools headquarters that has risen inside the shell of the landmark Ferdinand furniture building. The new facility, in the heart of Dudley Square, speaks to Boston’s deep economic divide. Dudley sits close to Boston’s thriving downtown, but has long been cut off from the economic advancement other neighborhoods have enjoyed. The construction crane over the Bolling Building site was the first to touch down in the neighborhood in several years. The new building provides an immediate injection of energy. New storefronts at the building’s base will turn the long-abandoned block into a destination; nearly two dozen retailers are fighting it out for four retail bays. A publicly-funded business incubator will advance entrepreneurial culture. It’s ridiculous to think that, on its own, a building full of municipal employees can reverse a neighborhood’s fortunes. And the Ferdinand block’s redevelopment was explicitly designed not to act like a silver bullet. Boston built the Dudley Square project as a statement of confidence in the neighborhood. It was designed to prime interest in the broader neighborhood from outside developers, and to trigger follow-on development in a neighborhood many developers have long ignored. This next phase of development is already percolating — at an old MBTA bus yard on one side of the square, and along Melnea Cass Boulevard on the other. Long-vacant city-owned parcels in the neighborhood are suddenly in demand. The Bolling Building business incubator will build on work already happening at the nearby Smarter in the City business accelerator. New development on the city’s part is spurring even more work in the surrounding blocks. The Bolling Building and the Burnham are special because they are catalyzing change at the neighborhood level. They really matter because of what each means for the neighborhood around it. • Paul McMorrow: How tall will a new BRA go?